This is my version of “scallopine,” which refers more to the thinly sliced nature of the meat than to any specific preparation. It’s the type of dish you might find in an old-fashioned Italian-American restaurant–moist and comforting as something your Italian grandmother (real or imagined) used to make. It’s a juicy dish, so it’s best served either with rice or pasta (although in Italy rarely do they serve their pasta alongside their main course). The dish only takes about 15 minutes from start to finish, assuming you have some chicken broth in the house (bouillon is fine). I happened to have my duck stock in the freezer from my deconstructed duck. 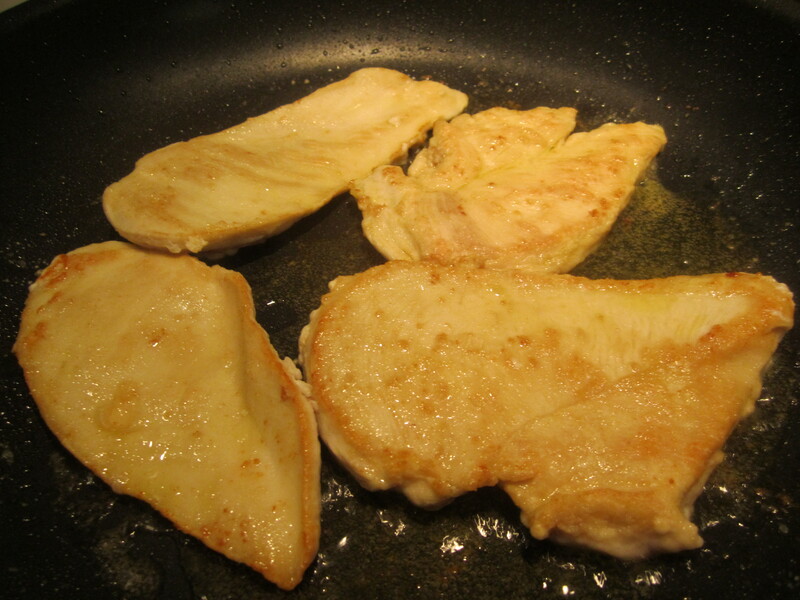 In my scallopine, the chicken breasts are pounded thinly and dredged in flour, then lightly browned in olive oil. White wine is added, along with a touch of tomato paste, some chopped tomato, and chicken broth. 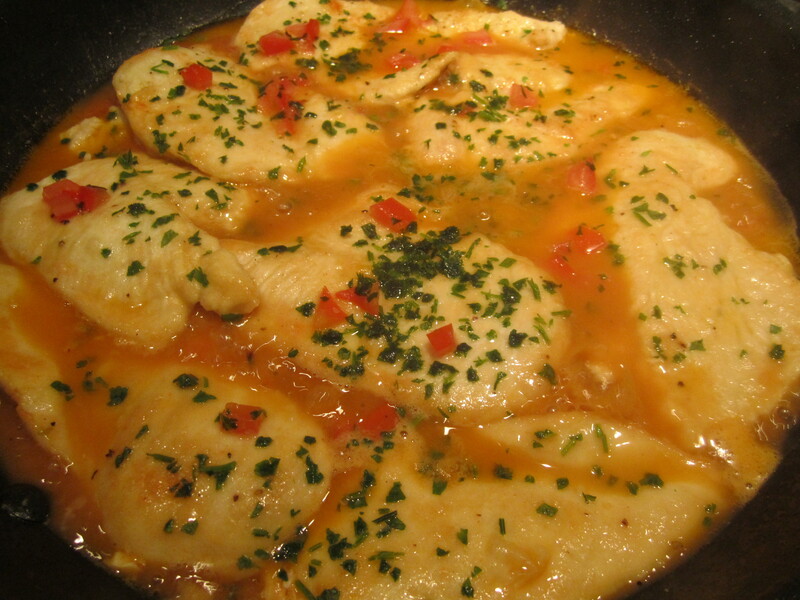 This is simmered for 5 – 8 minutes, then showered with fresh parsley. The dish holds well off the heat, and, like many moist dishes, may be reheated (very gently on low heat) at the last second. 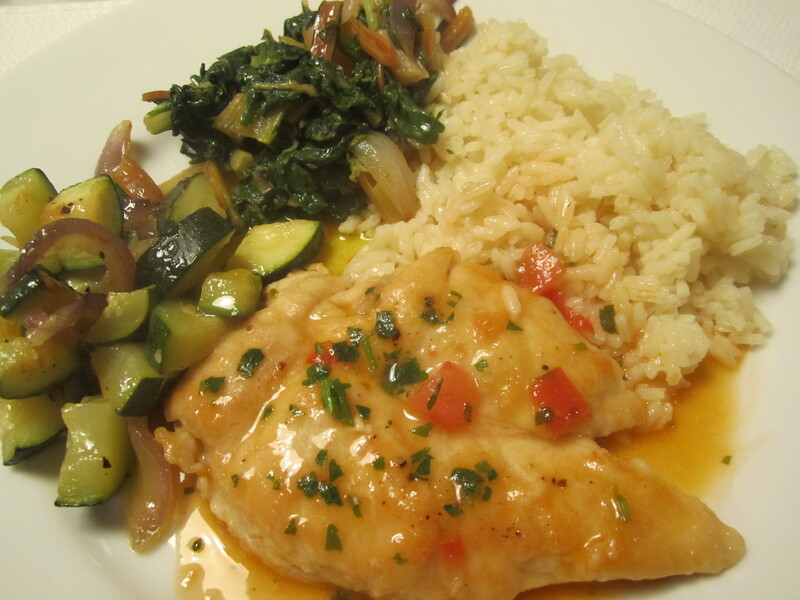 Tonight, I’m serving the chicken with arborio rice, sauteed zucchini and onions, and sauteed swiss chard. In a broad skillet on medium heat, heat oil for a minute or so, then add half the butter. 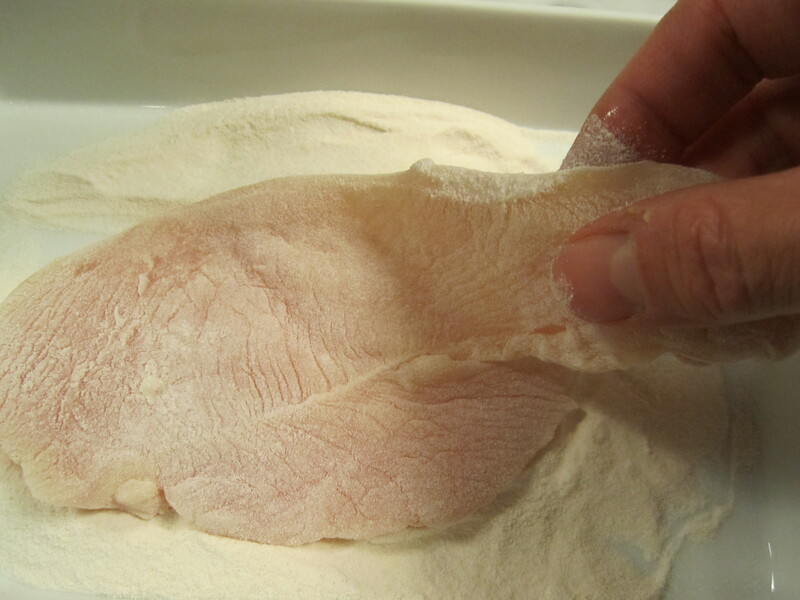 Dredge the chicken lightly in flour and shake off excess. Slip into hot oil/butter and sprinkle a liberal amount of salt evenly over all the pieces. Cook on medium heat only until lightly browned (about a minute). The chicken will not yet be cooked through. Remove from pan and repeat with a second batch, if necessary. Turn heat to high. Add wine and reduce for about 2 minutes. Add in stock, tomato paste and chopped tomatoes. 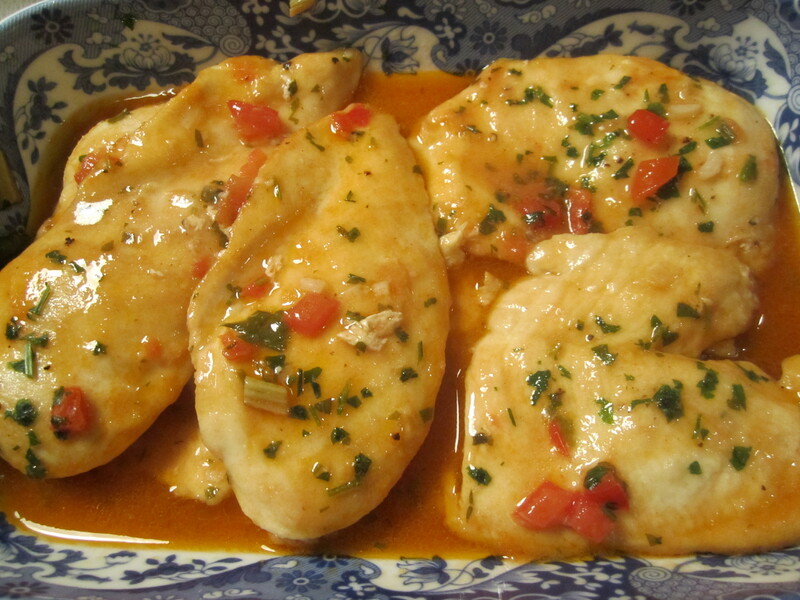 Add back the partially cooked chicken breasts and continue cooking on low heat for about 5 – 7 minutes. Add the remaining butter and chopped parsley and add salt, if necessary. May be made up to one hour ahead, then reheated very gently on low heat prior to serving.